Today I'm showing 2 World Inspired Colours, which were kindly send to me for review by Herôme. The polishes that they send me are Amsterdam and Kingston, and that was a nice surprise because I didn't know W.I.C. also had a holographic polish! The application on both was very smooth, and I really liked the brush. It's a flat brush which isn't too wide or too small, just right for my nails. The drying time was fine too. 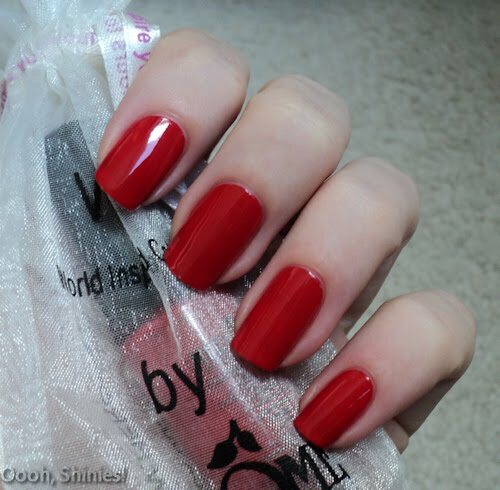 Unfortunately my camera thinks this polish looks better when it's a bit lighter, so just imagine it a bit deeper red. I used 3 coats and no top coat, 2 was enough irl but the macro option is harsh on showing visible nail lines, so I added a 3rd for the pictures. The polishes came with little bags that I think are nice when you give a W.I.C. polish as a pressie to someone, it adds a little something extra. 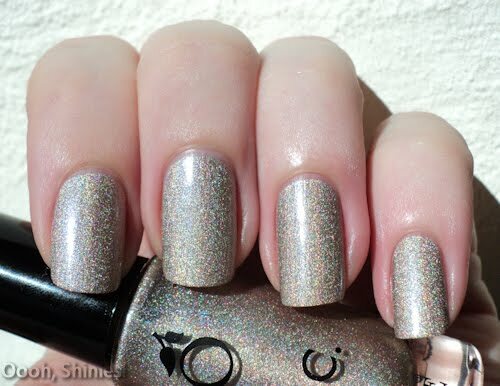 Kingston is a golden-ish beige holographic and I used 2 coats here, without top coat. With some holo polishes it's easy to pull bald spots in previous layers, but I didn't have that problem with this polish, and it dried up pretty shiny. The holo is more visible irl, it seems my camera is having a bad day! The W.I.C. polishes cost €7,50 for 1, and €12,50 for 2. You can buy them in stores or in their webshop.